Posted on December 29, 2005 by Ching under Family. 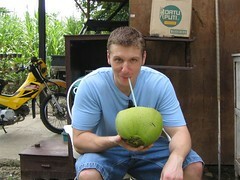 Fresh coconut juice, anyone? That stuff is so delicious and refreshing. It’s been a while for me. And yes, I admit that I am a teensy weensy bit jealous. When Jen’s boyfriend Ray asked if he could go home to the Philippines with mom and dad a few months ago, I thought he was nuts. I thought mom was nuts for agreeing. It was kind of strange that he traveled with mom and dad without Jen. Anyway, he seemed to have fun though despite Jen’s inability to go with them. I think it would have been more fun for him if he were able to hang out with people closer to his age. Maybe next time Brian and I will have enough money to go also. How about that Ray? Ready for another trip to Tanjay? Mom actually said that you’ll probably have to guide us because you will know your way around better than me. It has been eight years since my last visit after all. P.S. Thank you for our pasalubong. That was really thoughtful of you.